We’ve been hearing a lot about the presidential family vacation on Martha’s Vineyard this week. Imagining Sasha and Malia Obama exploring a landscape so different from Chicago and Washington, D.C., reminds me that for many children, vacationing at the seashore is an early and powerful introduction to the natural world. 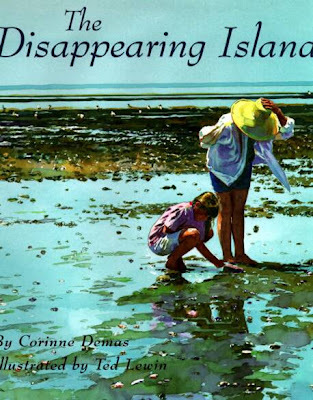 • The Disappearing Island by Corinne Demas, illustrated by Ted Lewin. Limpid watercolors illustrate a 9-year-old girl’s birthday ride to Billingsgate Island — the “disappearing island” of the title — off Cape Cod. This book was one of Ursula’s favorites when she was younger. 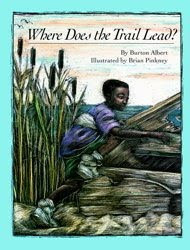 • Where Does the Trail Lead?, written by Burton Albert and illustrated by Brian Pinkney, is a simple book that starts with the question, “On Summertime Island, where does the trail lead?” Scratchboard illustrations show a young boy, over the course of one day, exploring beach, tide pool, saltwater marsh, blueberry bushes, rocks, and dunes. I’ve always liked how the book captures the essence of summer on an island. • Island Boy, written and illustrated by Barbara Cooney. The story of Tibbetts Island and the family that gave its name to the island off the coast of Maine centers on young Matthias Tibbett, youngest son of a salt farmer who becomes a ship’s captain and learns where his heart lies. • Island Rescue by Charles E. Martin, a cover illustrator for The New Yorker who also illustrated the book. The book is part of a series that includes Sam Saves the Day, Summer Business, and Island Winter. Sadly, the series is no longer in print, but the books capture the pace and pleasures of island life, for summer guests and residents alike. • Night of the Moonjellies by Mark Sasha, was brought back into print a few years ago by Purple House Books. It’s the story of a boy who helps his grandparents run their summer restaurant on Cape Cod and is taken to see a special phenomenon of the nighttime sea. • Crab Moon, by Ruth Horowitz and Kate Kiesler, is a story of a boy and the annual return of the horseshoe crabs to Cape Cod. This is one of Virgil’s favorites. Reading any of these books is almost as good as finding an island of your own — without the Secret Service and the crowds.